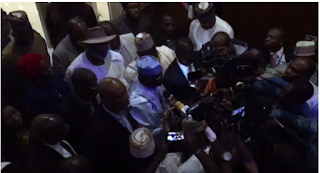 The Presidential candidate of the Peoples Democratic Party, Atiku Abubakar, changed his mind about participating in the debate after arriving at the venue of the debate. Although he showed up at the venue of the debate after his return from the United States, the PDP candidate left the venue without mounting the podium for the debate. President Muhammadu Buhari, who was also invited for the debate did not show up at all, leaving only presidential candidates of the Allied Congress Party of Nigeria (ACPN), Oby Ezekwesili; Alliance for New Democracy (ANN), Mr Fela Durotoye; All Progressives Congress (APC), Muhammadu Buhari; and Young Progressives Party (YPP), Kingsley Moghalu, to debate. In a series of tweet after his departure, Atiku blamed President Buhari’s absence for his decision to leave. Afterall, you cannot shave a man's head in his absence. I do not believe in attacking a man who is NOT here to defend himself.